POST YOUR V2 TIME AT HERE, is any1 still playing V2 now days???? I know it's pretty dead, but I played V2 last week! Hey is your aka MITSU? yeaaahhh anyways.. so are you really mitsu? no...i'm just posting my time.. 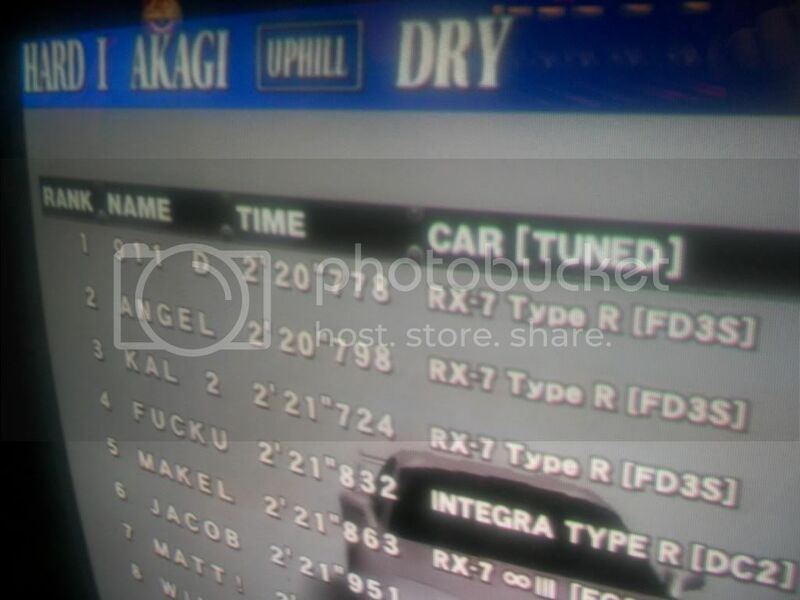 I was at my local arcade (25 miles away) a few days ago with my MR-2, I went and posted a time on my fav track, Akagi. (This is what I beleive is on it, apart from a few days ago, it was quite a while since I last played). Akagi TA Uphill, in the Dry, at Night : 2.34.007 2nd at my arcade. Now I know these times will probably seem SLOW, but the machine is in the highlands of Scotland (UK) at a privately owned arcade. Another MR-2 (Tune B), a MR-S (Tune B), a Celica (Tune A), a Silvia R-15 (Tune B), a S2000 (Tune B), and a FDS3 Type-R (Tune A), if anyone can come up with a reason why not to pick the certain tune for certain card at purchase, do speak up. This hopefully shows that not all of the old machines aren't being used, and that people can still have fun, even with out the latest machine. 911D was my friends card.